You can apply a style or effect to a picture to visually enhance the way it appears. For example, you can distort a picture, blur a picture, or change the style of a picture's edges. Click the picture, and then click the Format Picture tab. Click Quick Styles, and then click the style that you want. Click Picture Effects, point to a type of effect, and then click the effect that you want. To fine-tune the effect, click Options at the bottom of any effect menu. 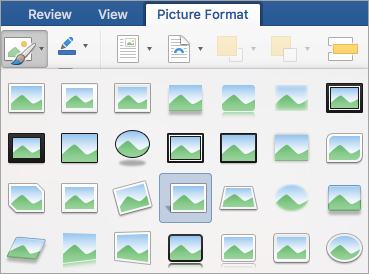 Under Picture Styles, click the style that you want. Under Picture Styles, click Effects, point to a type of effect, and then click the effect that you want. 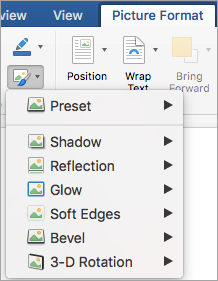 To fine tune the effect, under Picture Styles, click Effects, point to a type of effect, and then click [effect name] Options.